Spain did not join NATO until May of 1982, but even before that date the Spanish Government had issued a requirement for a new fighter/attack aircraft that would replace its fleet of F-4C Phantoms, F-5 Freedom Fighters, and Mirages F 1. In response to the announced requirement, the US government initially offered Spain an interim loan of 42 ex-USAF F-4E Phantoms, followed by the sale of 72 F-16s. However, the F-18 entered the competition in 1980, offering the benefit of a twin-engine safety margin. In December of 1982, Spain announced that they had selected the Hornet, and made plans to order 72 single-seaters and 12 two-seat versions. However, this proved more than the Spanish government could afford, and the order was reduced to only 60 Cs and 12 Ds on May 31, 1983. An option was taken for 12 additional Hornets, but due to budgetary restrictions, they were not taken up. 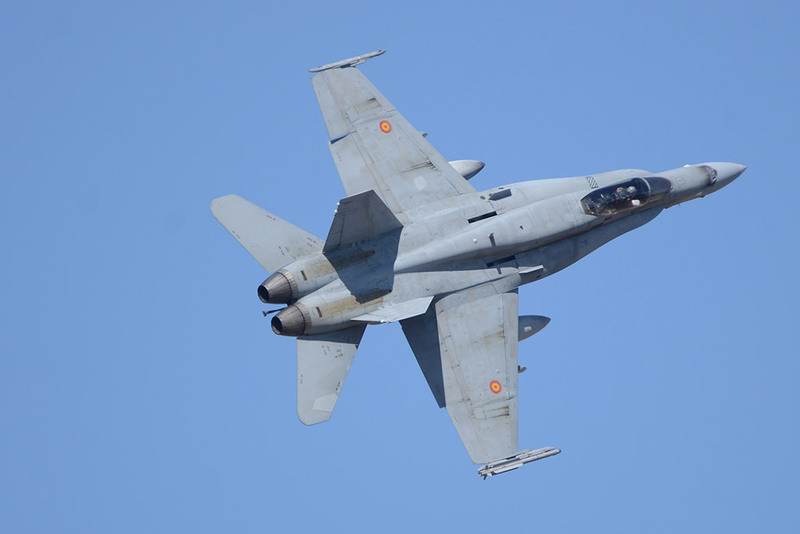 The first EdA (Ejercito del Aire) Hornet, EF-18B (“E” stands for Espana), CE.15-01, was presented in a formal ceremony at St Louis on November 22, 1985, and made its initial flight on December 4. 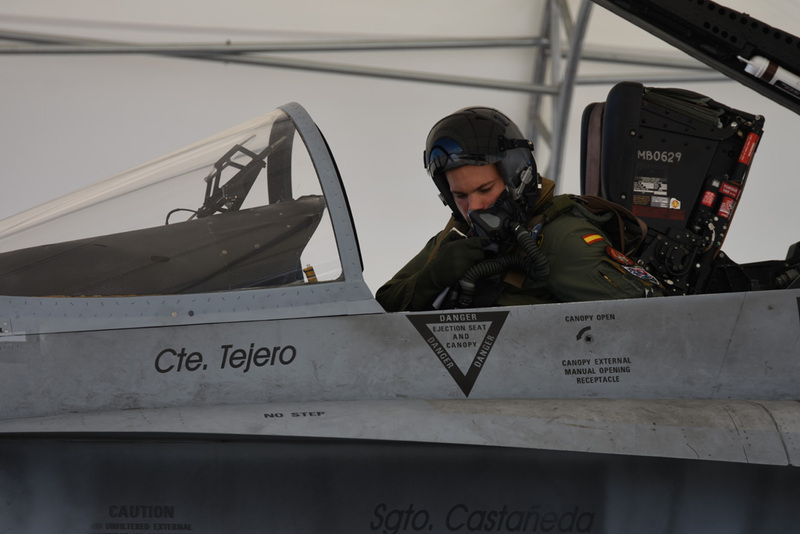 The first few two-seaters were sent to Whiteman AFB in Missouri, where McDonnell Douglas personnel assisted in the training of the first few Spanish instructors. The first two-seater was flown to Spain on July 10, 1986. By early 1987, all 12 two-seaters had been delivered to Spain, after which the single-seaters were delivered. A total of 60 EF-18As and 12 EF-18Bs were delivered to Spain, the last planes being delivered in July of 1990. The orginal version was A and B, but since the beginning of the delivery, there was a plan to convert 71 cells to the version A+/B+, which was similar to the C/D U.S. Navy versions. McDonnel-Douglas converted 46 aircraft, while the other 25 was converted by EADS CASA at Getafe, between 1992 and 1995. 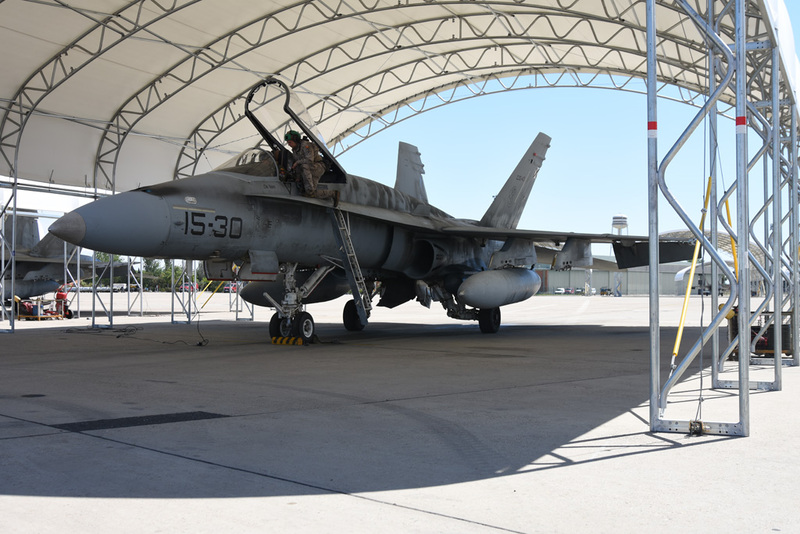 As part of an offset agreement reached with Spain, Construcciones Aeronauticas SA (CASA) is responsible for the maintenance of EdA Hornets. The upgrade work was completed under engineering change proposal 287 ( ECP287). It added new mission and weapons computers, new wiring, pylon modifications and software, the AN/AAS-38B NITE Hawk targeting pod, although this was later replaced by the Rafael Litening and Reccelite sysotems. These Hornets also received the Raytheon AN/APG 73 radar and an AIM-120 Amraam capability, with GBU 24 laser guided bombs and IRIS-T short-range air-to-air missile. 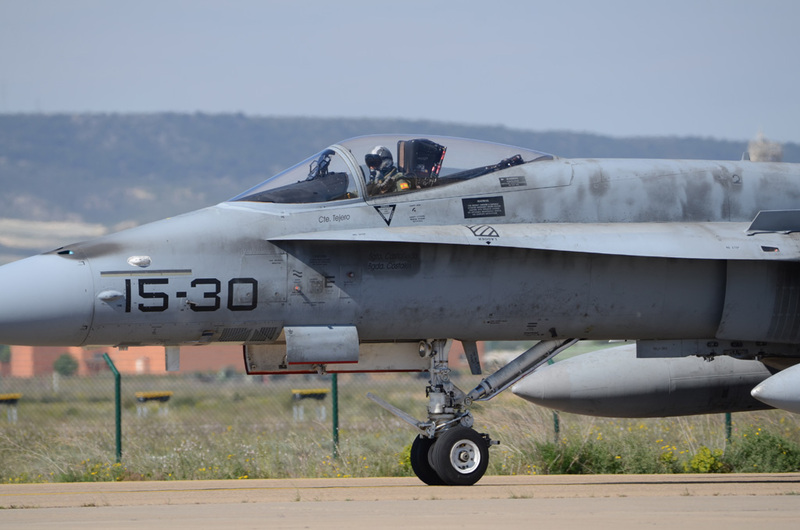 The spanish Hornets have played roles in combat operations over the Balkans between 1995 and 1999 and more recentely over Lybia in 2011 during Operation Unified Protector. 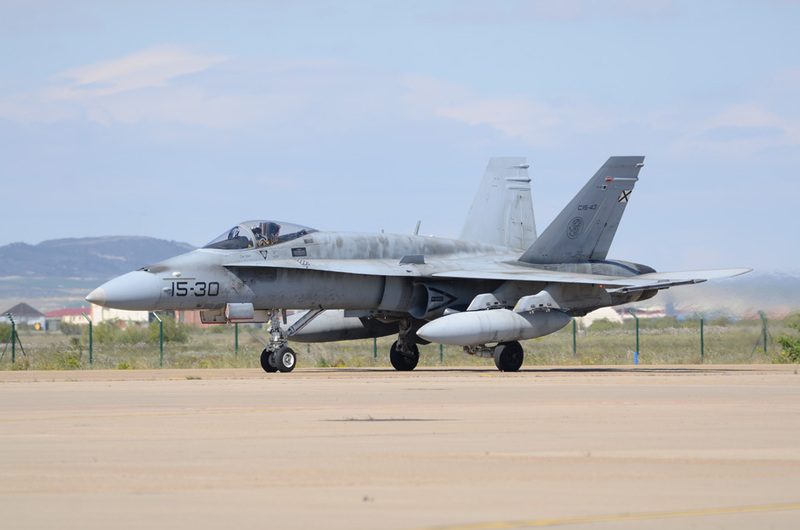 Spanish Air Force EF-18 Hornets have flown Ground Attack, SEAD, combat air patrol (CAP) combat missions in Bosnia and Kosovo, under NATO command, in Aviano detachment (Italy). They shared the base with Canadian and USMC F/A-18s. Over Yugoslavia, eight EF-18s, based at Aviano AB, participated in bombing raids in Operation Allied Force in 1999. Over Bosnia, they also performed missions for air-to-air combat air patrol, close air support air-to-ground, photo reconnaissance, forward air controller-airborne, and tactical air controller-airborne. Over Libya, four Spanish Hornets participated in enforcing a no-fly zone. As the most of the Air Forces in the world, even Ejercito del Aire has undergone a process or modernization and rationalization of its air fleet. The RF 4C, Mirage F1 had been retired from service, and nowadays the front-line of Spanish air force is provided by EF-2000 and EF-18M. 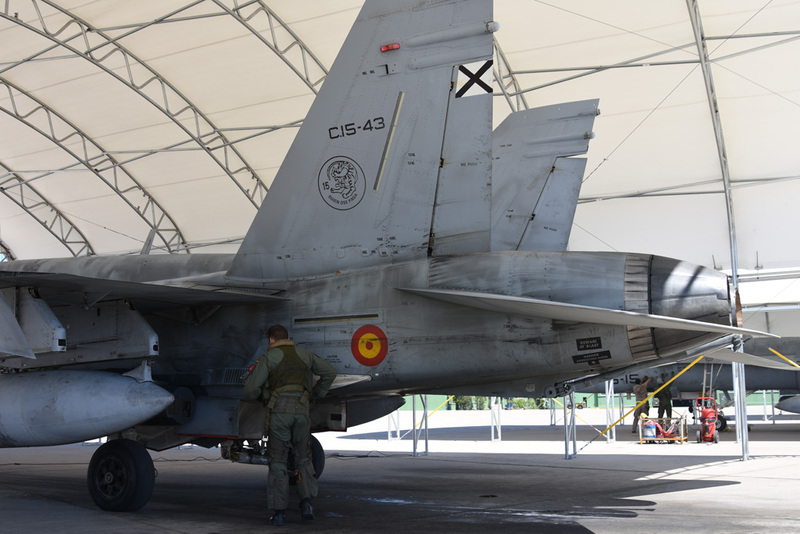 The current EF-18M (Spanish military designation C 15M and CE 15M for the two seater) stemmed from a mid-life upgrade (MLU) led by EADS CASA covering 67 of the original EF-18s. The program started on 2000 and completed on 2009. The main medernization consist in a new tactical computer, known as the Tactical Pilot Awareness Computer TPAC. It facilitated the addition of newcolor cockpit displays, improved identification friend or foe (IFF), new comunication system including Have Quick II radios and an updated GPS navigation system. Internal/external lighting compatible with night vision goggles (NVG) was added, along with a four-channel video data recorder. Provision was made for introduction of the Multi-Functional Information Distribution System (MIDS), plus a new up-front control panel. This was the primary upgrade, but durning the following years, some smaller new steps has been added: the most important on 2010, with the introduction of weapons control and MIDS upgrades, plus the SPAI-900 EW suite, which comprises AN/ALR-400, AN/ALQ-500 and AN/ALE-47 sub-systems, and KEPD 350 Taurus long-range cruise missile. The last upgrade in 2017 includes the Thales Scorpion helmet-mounted display and a ROVER datalink for the targeting pod. 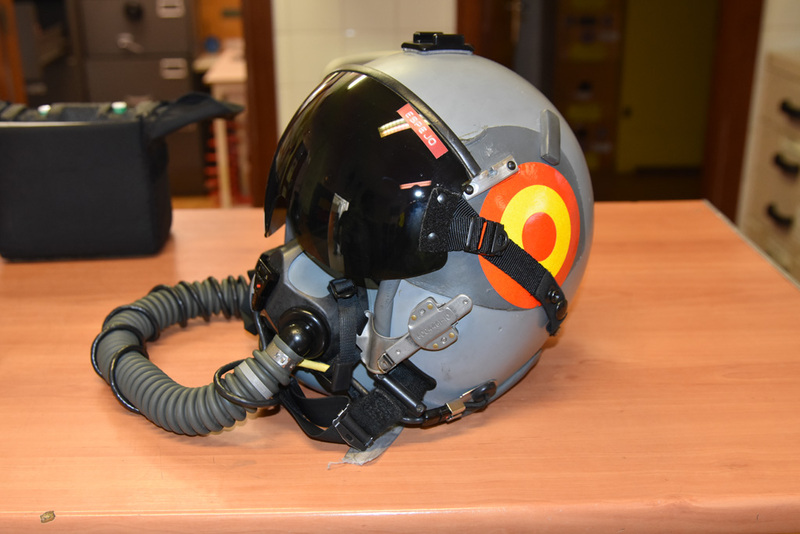 The Thales Scorpion provides full-color dynamic flight and mission data on a day/night monocle on the basline HGU-55 helmet. Spain has ordered 80 Texas Instruments AGM-88 HARM antiradiation missiles and 20 McDonnell Douglas AGM-84 Harpoon anti-shipping missiles. The Spanish Hornets carry the Sanders AN/ALQ-126B deception jammer and on the last 36 aircraft, Northrop AN/ALQ-162(V) systems. For air-to-ground work, EdA Hornets carry low-drag BR and Mk 80 series bombs, Rockeye II cluster bombs, BME-300 anti-airfield cluster bombs (that most likely will not be used anymore), BEAC fuel air explosive bombs, GBU-10 and GBU-16 Paveway II laser bombs, AGM-65G Maverick air-to-surface missiles and AGM-88 HARM antiradiation missiles. In the air-to-air mission, EdA Hornets carry the 20-mm M61A1 cannon, AIM-9L/M Sidewinders and AIM-120 AMRAAMs. 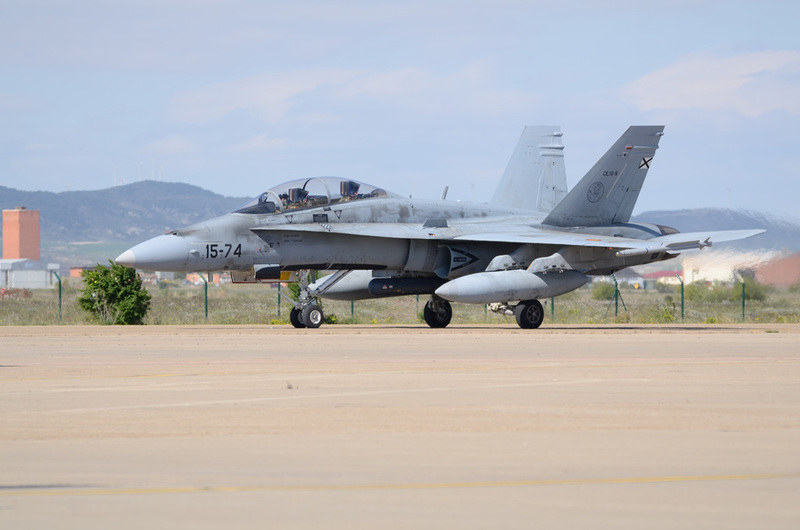 Spanish Hornets can carry AN/ALE-39 chaff/flare dispensers, ALR-167 radar homing and warning systems and ALQ-126B Jammers which have been supplaneted in most of the aircraft by the more advanced ALQ-162. 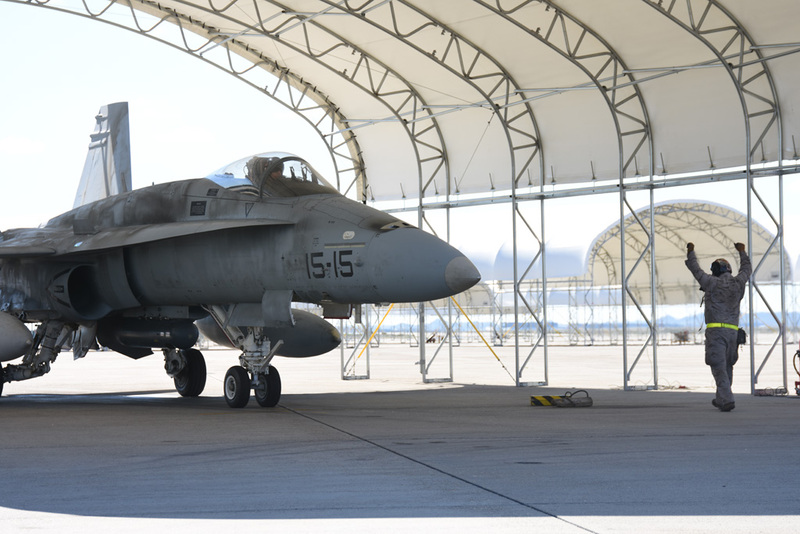 EdA Hornets can carry the AN/AAS-38 Nite Hawk FLIR/laser designator pod on the port fuselage stores station. Air refuelling for the Spanish Hornets is provided by KC-130Hs from Ala 31. The Ala 15 is a relatively young Unit, heir of the dissolved Ala 2, estebilished on 16th December 1885 expressly to host the newly delivered EF-18 A/B Hornets to Ejercito del Aire. 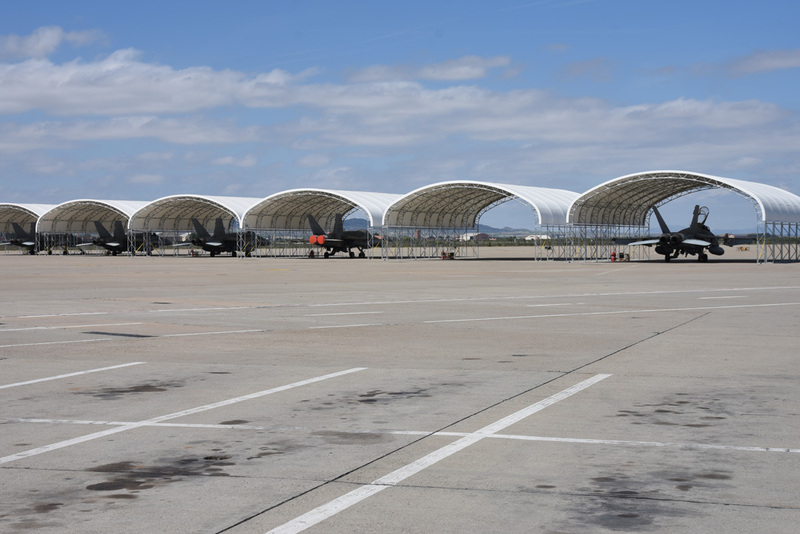 Ala 15, based in Zaragoza airport, is one of the biggest wing of Ejercito de L’Aire, and it is composed by three flying Wings: 151, 152 and 153. The EF 18M is a multirole aircraft and this allows the Unit to provide several type of missions. The main role of the Squadrons is air-to-ground attack, that takes the 60 percent of the activities and training of the Unit, while air-defence and reconnaissance keeps the other 40 percent of the efforts of Ala 15. 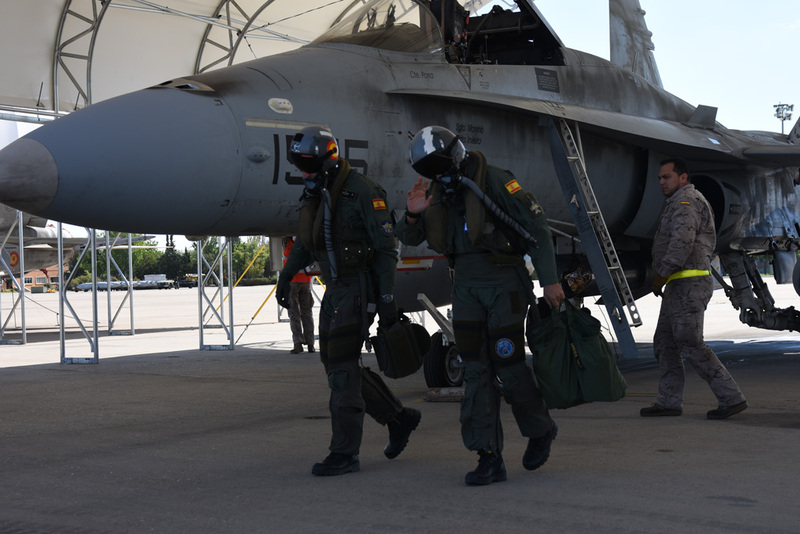 151 and 152 Squadrons use the powerful of thier Hornets to provide those missions, while 153 is resonsable for the operative conversion (OCU) of all the young pilots assigned to the EF 18M fleet of all the Units, Ala 15 in Zaragoza, Ala 12 in Torrejon and Ala 46 in Gando, Gran Canaria island. In case of war, each of the four front-line squadrons is assigned a primary role-121 is tasked with tactical air support for maritime operations, 151 and 122 are assigned the all-weather interception role, and 152 is assigned the suppression of enemy air defenses (SEAD) mission. The Hornets of Ala 15 are responsable of SEAD (Suppression of Enemy Air Defence) and it is the sole Unit able to provide this role thanks to the AGM 88 HARM missile. At this moment there is not official plans about the future of the EF-18M in the Ejercito del Aire. Its retirement is probably supposed to be in 2030. Considering the big experience of Spanish technicians and pilots with the EF-18, one of the most pleasing candidates could be the F 18E Super Hornet, but Spain is also looking with interest even to the F 35B Lightning II. A big thanks to Spanish Ministry of Defence and to all Ala 15 crew.